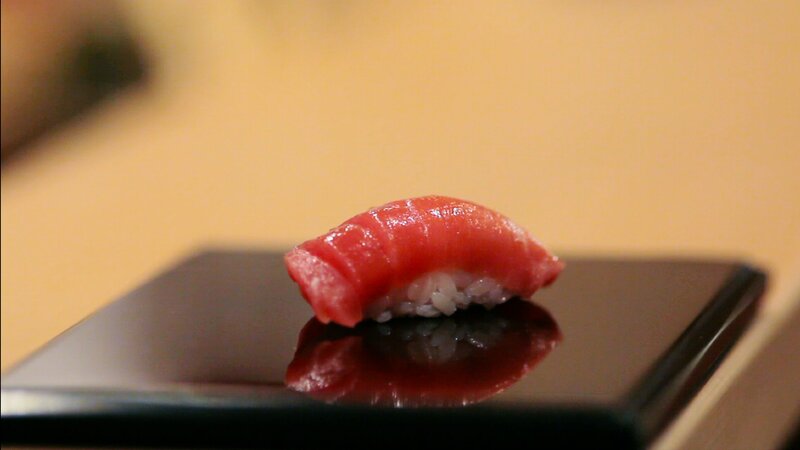 Jiro Dreams of Sushi is the only documentary in 2012 that I’ve bothered to watch more than once. And I admit that this has nothing to do with artistic merit. David Gelb’s film introduces us to a great sushi chef and — let’s face it — a great artist. But there’s nothing particularly remarkable about the movie itself. It’s a familiar formula: “Here’s a great man, here’s the story of how he rose to fame and fortune out of unspeakable hardship, here is his work, here is the unbelievable amount of effort that goes on behind the scenes….” Etcetera, etcetera. You’d have to go out of your way to prevent this story from inspiring people. But the food. The food! Each plate of Jiro’s sushi sparkles like the work of a master jeweler, but this jewelry sets you to salivating. You’ll believe that this is a restaurant worth the price of a trip halfway around the world. Why do we torment ourselves by watching movies about people cooking and eating when we cannot share the meal? Perhaps the mere sight of good food, colorfully presented, stimulates our senses so that we experience the film more intensely. I’m not a “foodie”; I enjoy a good meal, but I’m more concerned about quality than quantity. (My doctor recently recommended I start eating bigger meals — a surprising prescription.) But my moviegoer memory is a gallery of culinary moments, and I’m sure you could add quite a few memories of your own. Mention Animal House: I think of the food fight. Mention Monty Python’s The Meaning of Life, and I think of the man who ate too much — precisely, one after-dinner mint too much — and suffered disastrous consequences. When I think of The Fisher King, one of my favorite movies, I immediately remember a romantic scene set in a Chinese restaurant, where Robin Williams and Amanda Plummer chased a sprig of broccoli around the table with their chopsticks. Someday, somebody will make a great highlight reel showing Bill Murray’s many, varied, and hilarious scenes involving food: the carrots in Broken Flowers, the cracker in The Royal Tenenbaums, the coffee pot in Coffee and Cigarettes. And have you noticed how often Brad Pitt busies himself with food onscreen? But food can provide much more than an opportunity for comedy. Eating is such an essential part of the human experience that that when characters take time for food, they become more human for us. A culinary preference can make a villain into a living nightmare, or a hero into someone with a particular personality. Hannibal Lecter, for instance. The Silence of the Lambs makes a strong impression because Lecter doesn’t just kill his enemies — he eats them. He haunts our culture’s imagination even more fiercely because of his particularity. You can probably quote these lines along with me: “A census taker once tried to test me. I ate his liver with some fava beans and a nice chianti.” With that defining line, Lecter became much more than a stock villain. We remember Pulp Fiction’s Vincent Vega from because he’s a violent buffoon. But don’t we also remember him because of his feelings about five-dollar milkshakes and the “Royale with Cheese”? Po, the hero of Kung Fu Panda, desires dumplings as much as Pooh Bear has a passion for honey. Po’s wise teacher Shifu exploits that hunger in order to whip his apprentice into shape. In Spanglish, we learn that excellence matters to John Clasky (Adam Sandler) as he talks about his idea of the perfect sandwich. Many moviegoers left the theater craving that experience, and went in search of the recipe. Both big-screen versions of Roald Dahl’s Charlie and the Chocolate Factory delivered characters of unforgettable distinctions by focusing on their behavior in a wonderland of sweets. Candy brought out the worst in most, and the best in one. Sometimes, culinary preferences define whole families. Meals hold brothers and sisters together, or help them tolerate painful differences. Sometimes, food can form families out of strangers. In The Godfather, we learn that pasta sauce is an important ingredient for family rituals. This close-knit family of gangsters has demanding standards that enhance their powerful bonds of loyalty. In Pieces of April, young April wants to express her love to her family by cooking the turkey for Thanksgiving dinner, which proves to be a lot more work than she expected. Her increasingly desperate endeavors are a testimony of her care, and the result is a gathering in which grace and forgiveness flourish. In Ang Lee’s masterful family drama Eat Drink Man Woman, a retired master chef in Taipei is called in to save other chefs from culinary disasters. At home, he works under incredible pressure, trying to make his love for his daughters known through his cooking. But as he ages, his gifts are threatened, and his daughters’ love will determine whether such mastery will go on to bless others. The film also explores how the passions we repress will make themselves known in other ways. Lee’s film has been remade as a story of a Mexican-American family, in a film called Tortilla Soup. In The Station Agent, a home-cooked meal by an espresso-cart barista helped three lonely souls find community. Would You Like Your Life Medium-Rare or Well-Done? But wait, there’s more: Movies that ask us to think about eating are often asking us to think about how we live. In Stranger than Fiction, Harold Crik falls for a baker named Ana because she’s beautiful and challenging. But Ana also gets Harold’s attention because she talks him into tasting one of her chocolate chip cookies. That cookie is like a kiss that breaks an evil curse. It’s as powerful as the “blue pill” that Neo swallows in The Matrix — awakening him to a new world of sensation, freeing him from his humdrum life. These stories remind me of a scene in my favorite film — Wim Wenders’s Wings of Desire. When the angel Damiel, who has been transformed into a human being, experiences a hot cup of coffee on a cold morning, he begins to realize what is special about human experience. He relishes that coffee as if it were a sacrament. Perhaps this is why many of us go to the movies in the first place — to savor the richness of life. But many big-screen storytellers seem a little too eager to revel in life’s rich menu of experiences. How many times have we been told to “seize the day,” to indulge in carnal pleasures without any limits. One of the best examples of this is Chocolat — a favorite film for many chocoholics. Lasse Hallström’s movie has the simplicity and charm of a folk tale. 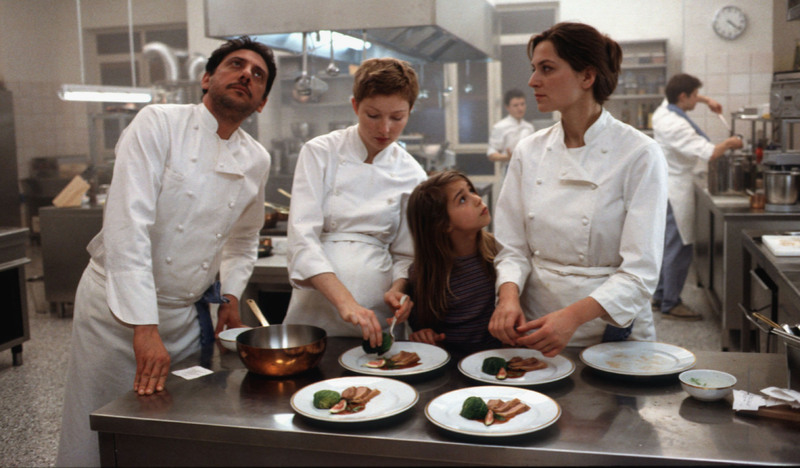 In it, a frisky young chocolatier named Vianne and her daughter move into a puritanical French village and set up a chocolate shop. As the villagers sample her wares, they begin to overcome their fear of sensual things. Unfortunately, the film has dangerous implications. The chocolatier, with her eagerness to help everyone indulge, shows she lives without the wisdom of restraint. She’s a single mother, trying to encourage healing and wisdom, but she does not hesitate to plunge into an affair with a charming stranger, a gypsy who floats down the river and flirts like a devil. But the religious people who frown on her impulsive ways are portrayed as foolish for having any standards. While the film does suggest that one can be both religious and adventurous, the conclusion leaves me feeling like I must choose between fearful abstinence or reckless abandon. I could fill a book with the insights conveyed through meal-oriented movies like Tampopo, My Big Fat Greek Wedding, The Age of Innocence, and Soul Food. For now, I’ll recommend three favorites that encourage us to consider what — and how — we eat and drink. Alexander Payne’s film Sideways introduces us to two men, Miles and Jack, who set out on a road trip to celebrate their bachelorhood one last time before Jack “settles down” to get married. Miles devotes himself to a pursuit of the finer things. For him, the goal of the road trip is to visit wineries and have profound aesthetic experiences. Jack, on the other hand, drinks to get drunk, and goes looking to get laid with any woman who will cooperate. He describes what it is about wine that he loves. He does not drink to get drunk, but to savor a moment. He likes to meditate on all of the hard work that went into such craftsmanship. Wine, for him, is about a costly gift that makes strong connections between people, cultures, and histories. And even as Miles describes this passion, sharing something with his new friend Maya, the wine cultivates love in a way he never expected. At the end of the film, there is hope that one of these men might find a profound blessing, while the other charges along accepting only the cheapest of thrills. 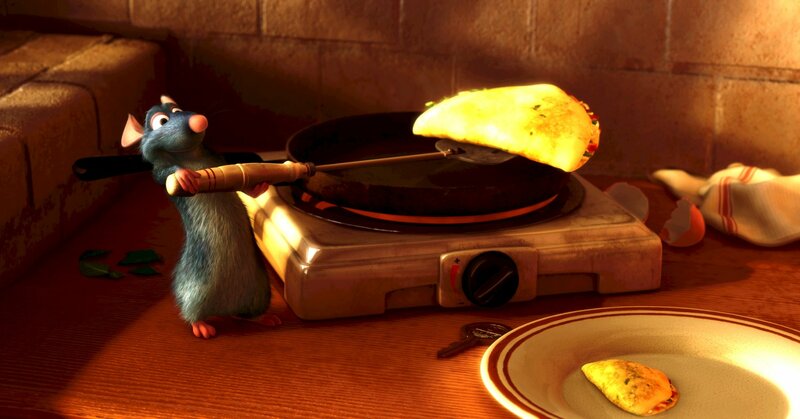 Most recently, Brad Bird’s film Ratatouille brought our attention to the fact that, while not everyone can be a master chef, we should not be too quick to judge. A great artist can come from anywhere. In Pixar’s extraordinary film, a food critic named Anton Ego has let his passion for food become a corrupting influence. He wields his expertise like a bludgeon, battering those who have less sophisticated taste. He flaunts his opinions and turns up his nose at whatever seems simple or ordinary. But when an unlikely chef — one with a pink tale, whiskers, and a twitchy nose — surprises him with a work of excellence, Ego’s world turns upside down. His perspective is transformed because it reminds him that he once sat down to a meal for love and the thrill of discovery. He goes on to praise “an extraordinary meal from a singularly unexpected source,” and to say that both the cook and the cuisine challenged his preconceptions. “They have rocked me to my core,” he says. In the humblest of locations, Ego discovers something deeply meaningful. Likewise, moviegoers find something richly meaningful in an all-ages, animated movie — a genre that has led us to expect brainless entertainment and cheap, tasteless jokes. These storytellers encourage us to value excellence, to pursue what is worthy of praise. But they’ve reminded us to do this with humility and an openness to discovery. For this moviegoer, there is no cinematic meal more beautiful and profound than Gabriel Axel’s movie Babette’s Feast. When Babette comes to work for a community of God-fearing people on the barren coast of Jutland, she learns how to cook for people who abstain from sensual pleasure. Consigning themselves to bland, boiled fish and dry bread, they don’t realize that their new cook is one of the world’s master chefs. But when Babette wins the French lottery, and has an opportunity to escape, she does something extraordinary instead. She prepares an authentic French feast — the best she can prepare-for the villagers. As she invests in blessing them, the villagers approach the table with fear and trembling. They pretend to ignore what they’re eating, even as they’re awakened to a world of transporting sensations. The reverence of their servant, the beauty of the presentation, and the myriad surprises of the meal give them joy and a kind of communion that they have been missing. Babette is quietly fighting the Gnostic lie that the spiritual life is separate from physical experience. She is revealing the glory of God to them through food. She shows them that food, like all of God’s great gifts, is meant to be celebrated and shared with vigor, reverence, and gratitude. It might even have the power to make friends out of enemies. Note Babette’s fearlessness in demanding only the best, most sophisticated creations for the sake of revelation, even though no one present is likely to recognize any of her inventions. She could not have forseen that a soldier of refined culinary tastes would join the gathering, a soldier she has every reason to hate for his history of military endeavor. And yet, it is this man — an enemy — who declares to the table just how rare and sublime this experience really is. The soldier recognizes the wines, and his eyes widen at a sip of Clos de Vougeot. Blini Demidoff au Caviar, Potage à la Tortue (or ‘turtle soup’), and — to his utter astonishment — Caille en Sarcophage avec Sauce Perigourdine. The diners enjoy a salad of Belgian endive and walnuts, drizzled with vinaigrette. They taste grapes, papayas, pineapples, and expensive cheese. For dessert, there’s rum sponge cake with figs and glacéed fruits. Numerous rare wines, including , along with various champagnes and spirits, complete the menu. Even the place settings are the finest available — the finest china, silverware, and crystal. And yet, when the meal’s over, Babette demonstrates that even though she appreciates fine cuisine more than anyone in the village, she is humble enough to be content with just a sampling from the table — just as she has refrained from complaining about a diet of boiled fish. This is a lesson that I — as a sometimes cantankerous film critic — need to learn, and learn, and learn again. I should acknowledge mediocrity and pursue excellence, in hopes of enjoying the great and sensual blessings of life. But if I become snobbish about what pleases me, and show disdain for simpler things, then I’m surrendering to the impulse of ego. If I’ve learned anything about excellence, it’s my responsibility to share that with humility and grace. And I must never cut myself off from encountering surprising revelations in unexpected places. Perhaps it was Babette who inspired the two Italian cooks in the film Big Night, Primo and Segundo. After they serve an extravagant feast, they clean up the kitchen and sit down — exhausted — to a meal of their own. They haven’t eaten any of their own masterpiece. They’re content with simple plates of pasts. But in giving their best away, they’ve experienced something even more profound. Isn’t that interesting — the idea that characters would discover joy, freedom, and abundant life through the process of tasting, chewing, and swallowing? A wise man once asked his followers to commune with him in his life, and his death, by eating and drinking. But not just by eating and drinking. He asked them to eat bread. He asked them to drink wine. Both of these nourishing experiences are made possible when materials are put through a rigorous, violent process, and then transformed into something new that brings life to others. There is a reason behind Christ’s decision to employ bread rather than rice, and wine rather than grape juice. These things mean things. The more we meditate on what they are, the more we see that they are rich with poetic significance. 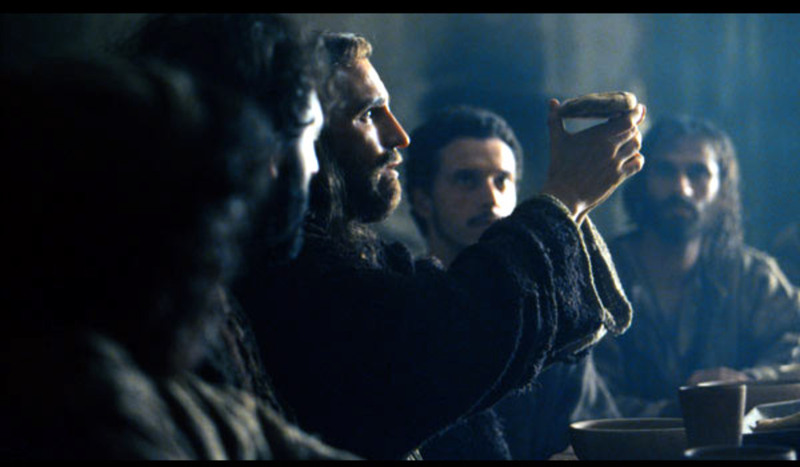 Martin Scorsese could not resist depicting the transubstantiation of the elements in The Last Temptation of Christ — that as a disciple tasted the bread, he was tasting the flesh of his savior. Incarnation does not stop when words become flesh. Flesh becomes food. And food nourishes our whole selves. “Do this in remembrance of me,” the host recommended. What better way could he have imagined to make sure his listeners would ruminate on his words and absorb his love for them? 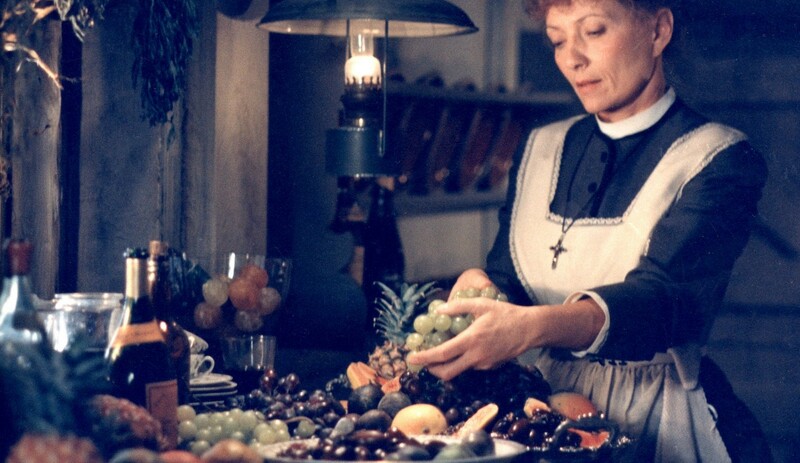 It is no exaggeration to say that Babette’s Feast, with its simple story about a meal, has inspired me to a greater appreciation of excellence, but also a greater appreciation of humility, service, and sacrifice. In fact, as I write about it, I’m feeling hungry for another visit to Babette’s table. I hate to say this, but I have yet to see Babette’s Feast. Reading this post, however, makes me want to check it out soon. One thing I have to ask…. Among all the other films you’ve listed, I see no mention of the Campbell Scott/Stanley Tucci directed film BIG NIGHT, which (without having seen Babette’s Feast) is my go to “food” film. Have you seen it? 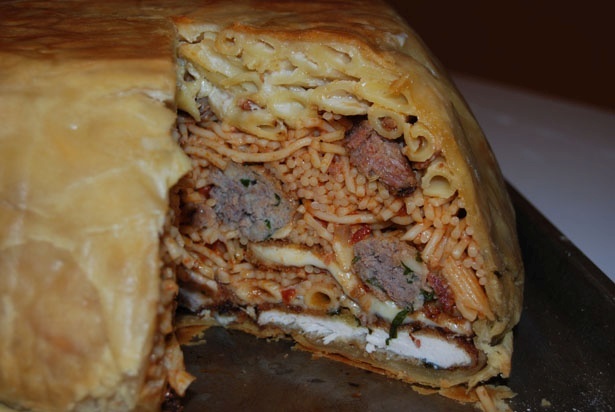 The unveiling of Timpano is one moment that is seared in my memory. A terrific little film to check out. John – go up a paragraph from “Do This in Remembrance of Me” – it’s there. Briefly. And Jeffrey – this is wonderful and rich and now I’m hungry! Thanks for your usual thoughtful and beautiful work. Jeffrey, you made me think about one of my favorite Bill Murray food moments–when he goes ape over the chicken in “What About Bob?” And Ratatouille is one of my favorite Pixar films. I love that you tied it all in to the Eucharist. Thanks for a great read, and like Diana, now I’m hungry!